Behold the Hector Saxe paparazzi magnet. With styling so bold, parma coloring so brilliant, and legendary Hector Saxe backgammon craftsmanship, it's like a short-cut to superstardom. Now you don't have to sell a zillion albums. Just head out your front door with this exquisitely appointed beauty of a board under your arm. The glint of brass fittings and the Hector Saxe nameplate may draw attention, but the slender stylings and faux-python leather will declare your mastery of media. We recommend you wear dark sunglasses to protect from flashbulbs when you're mistaken for a starlet, action hero, or platinum-selling musical genius. And wear comfortable shoes you can dash in, should you need to evade screaming mobs after an autograph. If you're cornered however, the jig is up. The real star is Hector Saxe - and it's fine that you should acknowledge that (you're the one with the means and good sense to have purchased one - no shame there, my friend). Hold it up high above your head, so the spittle-flecked adorers can oooh and awww. 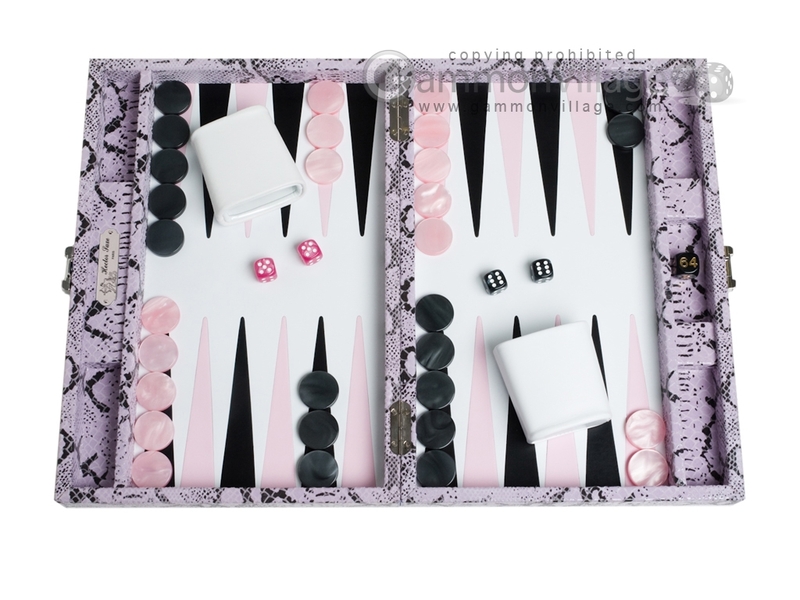 Then hush them as you open the perfectly sculpted case on whisper quiet brass hinges to reveal the gorgeous, shimmering pink and black checkers, white leather-wrapped dice cups and lustrous leather playing surface. As you're making your exit, be sure to thank the crowd for their adulation and then kindly direct them to our website, if you please. Page P4824 Copyright © 1999-2019 GammonVillage Inc., USA. All rights reserved.